I was always one of those kids who had to snoop for presents at Christmas because I hated waiting for Christmas Day. I’m still to this day one of those people who get so excited about giving someone something that I think they’ll like- so I usually spill the beans on what it is before the actual holiday. As such, is it any wonder that the design I wanted to save for Halloween Night would be done before it even was October? I wanted to do this design for so many reasons…. and so, I gave in and did it today!!! You A Gamblin’ Man, Santy? I then topped off with two coats of Seche Vite Top Coat. Whew! So, are you as excited for Halloween as I am???? ALSO! I in fact had more than one request for my Kiss My Ras(s)pberry franken recipe so here it is! I mixed all of the glitter in and tested the formula for glitter density, and then added about a 1/5th of a bottle of Nina Ultra Pro’s Love Struck (just got it on clearance at Sally’s for $1.99 and had to figure out the name). I mixed for several minutes and bam! Kiss My Ras(s)pberry was born. I also added a tiny bit (maybe 5 or so drops) of a Fantasy Maker’s hot red mini that I have, no name. But any red would do I suppose. This entry was posted in Nail Art and tagged black, blue, brown, creme, Essie, gray, green, Nina's Ultra Pro, OPI, orange, purple, red, Sally Hansen, Seche Vite, Sinful Colors, taupe, white, yellow by Tara. Bookmark the permalink. These designs just leap off the screen!!! WOW!!! Girl, you are over the top with this one. :) Your attention to the details and the ability to create them on your nails…I'm blown away. And check out how many followers you have…WOOT! Oh, I would peek too! Very nice! Also my favorite. I have done the characters on many nails..nice job! Oh. My. God. I have no words as I have no jaw no more. We do not celebrate Halloween in Holland. Ofcourse some weirdo's ( like me ) copy a little bit of this superfantastic holiday for fun. you are just amazing… absolutely fantastic.. so talented! you really should be famous .. because you are truly an artist. well done! Its 6:40am right now where im at and I just squeeled loud enough to wake my kids (i was supposed to be waking them anyway). I <3 NBC. Its a movie that is on heavy rotation from september thru december in my house. You should do this for halloween too! 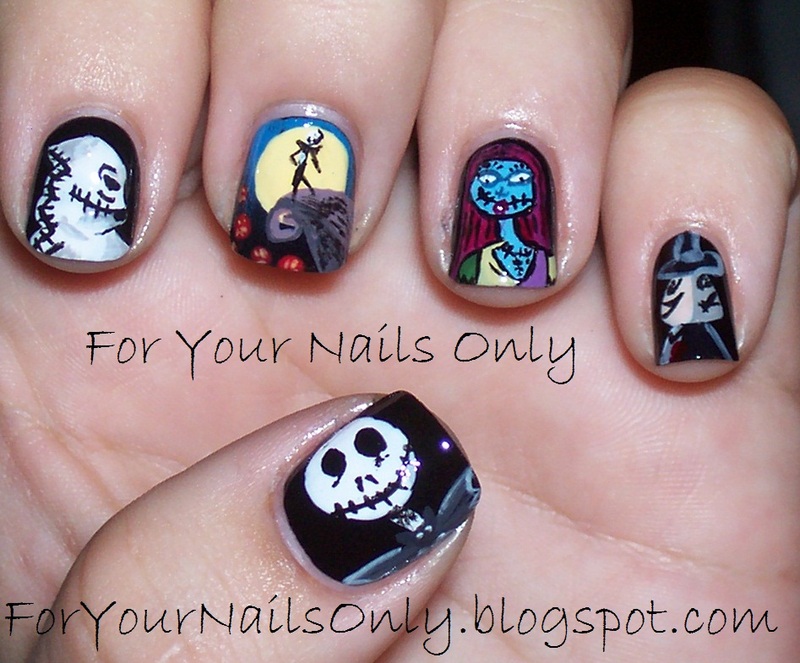 Ok, this has got to be one of the coolest mani's I've ever seen. Wow!!!! This is amazing! I love this movie, it is one of my favorites. I am very excited for Halloween as well. THE BEST DESIGN FOR HALLOWEN!!! ♥ it !! You are my favorite person right now… no, EVER. This is so awesome! Love your nail art…how long did this take you? This is Halloween! This is Halloween! Its stuck in my head, too! OMG. I totally emailed this to like 30 of my friends and we're all in agreeance, THIS IS INCREDIBLE!!! You never cease to amaze me Tara, keep up the good word honey. P.S. One of my friends who saw this is a hot shot exec at a nail company so you might wanna be on the look out for her email. Tara you are crazy talented!